I recently heard and read about an interesting Turkey Vulture behavior - spreading wings in the sun as if they are drying them. I couldn't recall ever seeing this, but sure enough, I stumbled across it at Boyce Thompson in early October. This behavior is very common in cormorants, seen frequently at bodies of water in Arizona. But cormorants do this to dry their feathers are fishing and swimming in water. Why would a Turkey Vulture do this? 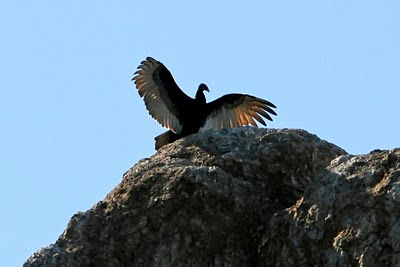 The theory is that the Turkey Vultures are in fact drying and heating their feathers to ward off feather mites. Feather mites are actually in themselves very interesting creatures - smart enough to move off of a feather that is about to be molted. Note that it is also thought to be a means of general thermoregulation, but that doesn't explain why they'd be doing it on 90+ degree mornings in the desert. Regardless, it was interesting to see this behavior in person.